THE Melbourne International Truck, Trailer and Equipment Show delivered on its promise of being the place business gets done and served as a great venue for the transport industry to come together. It was also a time to meet up with the people who love the industry. 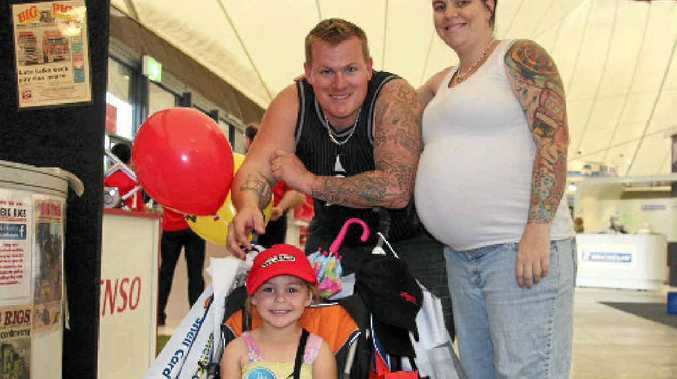 Peter and Verity Kalucy with baby Baileigh came to the stand to enter the competitions and pick up a copy of Big Rigs. "It's really good, I thought I'd be bored but I love it," admitted Verity about coming to the show. Peter was openly proud of what he thought about trucks, "I'm truck mad," he said. Paul Atkinson is a driver for Exodus Transport and said he was keen on truck shows and has even been over to Perth. We got his photo in the paper for one good reason. "I came to the show just to get a Big Rigs pen," he said. Paul reckons he gets the best mileage out of a Big Rigs pen when he is filling in his logbook - so we swung him a couple to tie him over until the next show. Unlike the last ITTES in Melbourne the back docks seemed much busier. The companies in the peripheral stands were much happier in general with a good degree of punters stopping by their stands. Charles Inder from Haultech was having a good time in Melbourne although he was missing out on one of his pet pleasures. "There has been no Coke, I had to stock up. I have had a few quality leads from the show though," he said. Peter Samios - the name behind Samios Tyres said this year the event was quiet but with a lot of promises and people picking up stock from the Melbourne store. He said there was a lot more competition in the tyre market now. "There is a lot more competition in the market down in Melbourne and we'd like our Melbourne store to do better. It's going well but we always want our business to go a bit better," he said. He said the Melbourne store has had a lot of staff changes and the new manager seems to be pretty good and they are ready to make their mark on the market. Great Whites have been the shining light in the trucking industry - look out for the comp in this edition of Big Rigs. "We are run off our feet with good quality enquiries," said Shayne Quaile from Great Whites. "We've looked at it and we have had a great show. "It is exciting when you have an innovative story," he said. Mark Heldoorn from Truck Tools only had good things to say about this year's show. "The ITTES is growing stronger all the time and we are very happy with it," he told Big Rigs. "We get a lot of interstate travellers through so we get a lot of new contacts. "It is good to make good connections with people and you get to deal with independent businesses so you can share business ideas and increase your product support network," he said. William Fu and Graeme Smedley from Transiblue claimed the show to be an eye opener. "It has been very enlightening; we found a lot of interest and are getting more suppliers," explained Graeme. "The good news is we've got to increase production to meet supply - we've also had interest from New Zealand, Victoria and Queensland and from several trucking companies. "It's because we are about 20% cheaper than everything else," he said. For three generations of truckies the show was well worth it. Jon, Stan and Rhys Jupp from Trash and Stash said "so far so good, I find value in coming to events like this. "This is what opens your eyes up to the new tools and equipment available to help your business." Ralph Rossteuscher from Loadman was looking forward to what the show would provide. "The show has generated some quality leads. These shows are always a long term proposition," he said. The Chemtech stand was one of the busiest with lots of people interested in the variety. Tanya Cook the Chemtech boss was very happy with the interest the company's stand generated. "It is good for us being at the ITTES in a sense of brand exposure," she said. "We have had people on the stand able to give our customers, and potential customers, technical advice and it also gives us an opportunity to expand our dealer network with our great product range." Remember to send Big Rigs a photo of your rig to bigrigs@qt.com.au . You can win a great prize in our Chemtech Big Rig of the Year competition. UD Laverton sales manager Leo Morabito was in the spirit of the ITTES on the Saturday with his son Luca practising his footy moves. "Thursday and Friday we had good quality customers," he said of the show. "As a group we took it upon ourselves to be here. "We wanted to launch the new product range in Melbourne. "The show has been fantastic and I can walk away and say it was money well spent," he said. The ITTES isn't just for truckies and owner operators but it is for everyone in the industry including mechanics and valuable customers from all sides of the business. Les Douglass from D & C Laser Alignments was seriously interested in coming to the show to see the Wanted Western Star. He said he saw it on the cover of a recent Big Rigs and had to see it in person. "I reckon it looks too good to be working on the road," he said. "It is typical of the yanks though, they have covered every, and any angle" Les was definitely impressed with the trucks and the show in general. "The truck was spectacular and the amount of detail just absolutely awesome." Barry "Tready" Treadway only had one thing to say when we asked him about the show when he came to visit the Big Rigs team to get a paper. "Bloody brilliant, good people and plenty to look at," he said emphatically. Graham Russell and his lovely wife Karola were impressed with the Mercedes Benz Actros V8 2660 Premium Pack. Graham said he worked in the waste industry carting garden waste. "It's a lot bigger than what I've got," he said. For driver Greg Tasker it was good t catch up with suppliers as well as looking at all the new gear. "It's good and well spaced, you're not bumping into anyone."